"Fell about a thousand feet"
I have to thank Bill of West in New England for proposing a GeneaBloggers Challenge along the lines of ... what was your ancestor doing in 1914? (I take the liberty of extending that further into the Great War period.) Otherwise I likely would not have spent days re-living ― second-hand ― the chilling experiences of my father. Another world. Yet modern versions of war and suffering continue today in many places. ... Or First World War, as we say in the Commonwealth. 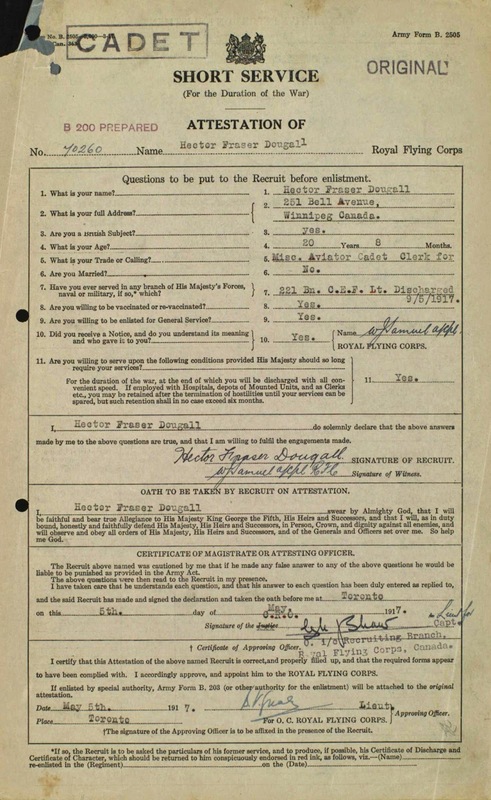 The only son in a Winnipeg, Manitoba, Canada family, Hector Fraser Dougall signed up in March of 1916 for the Canadian Expeditionary Force (CEF). He was nineteen years old and had already been part of the Winnipeg Highland Cadet Battalion, associated with The Queen's Own Cameron Highlanders of Canada. 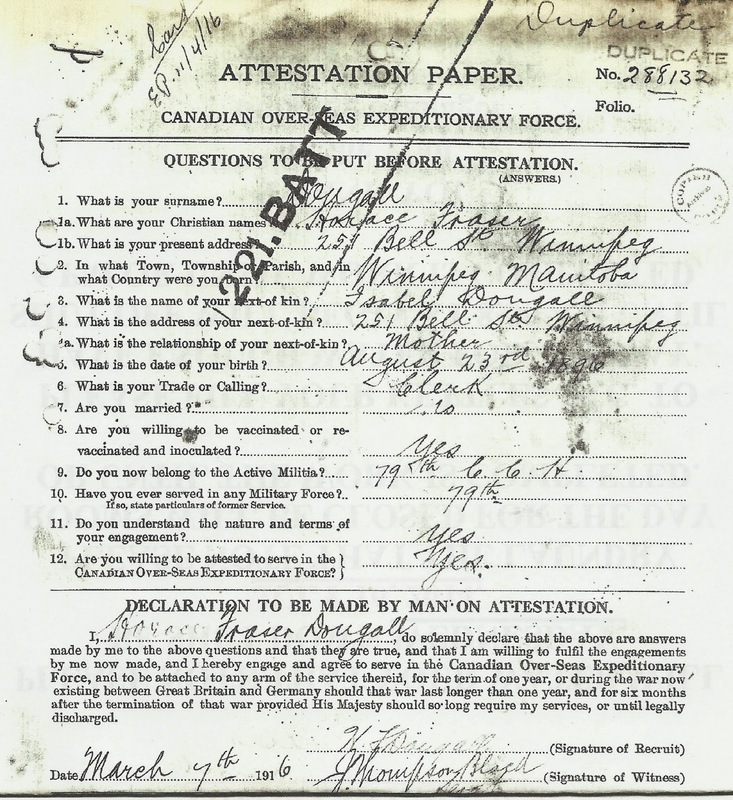 He had clearly waited some time after the death of his beloved grandfather, John McFadyen, in July 1915 ― time for his family to bear the grief; somehow I doubt John McFadyen would have approved of the enlistment. 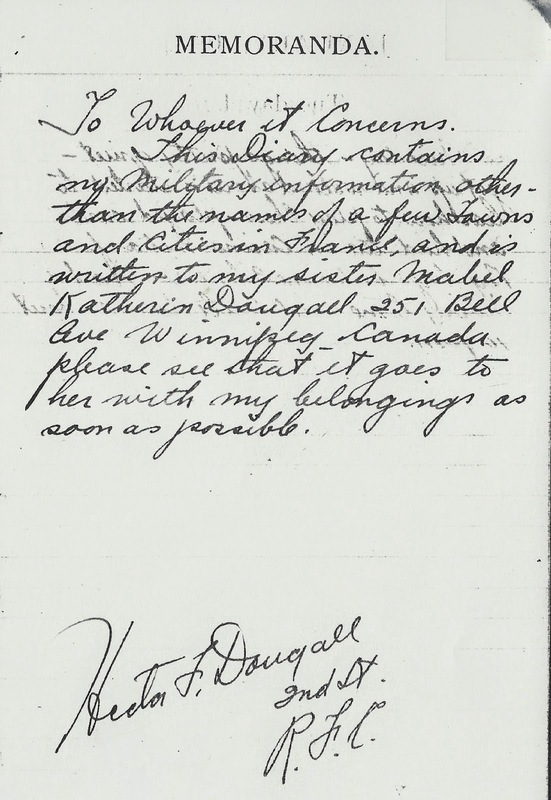 Notice that he signed the attestation as Horace Fraser Dougall. I've no idea if that can be attributed to high spirits or what he had in mind. Later in some medical papers he named himself Hector Fraser Victor Francis Dougall. 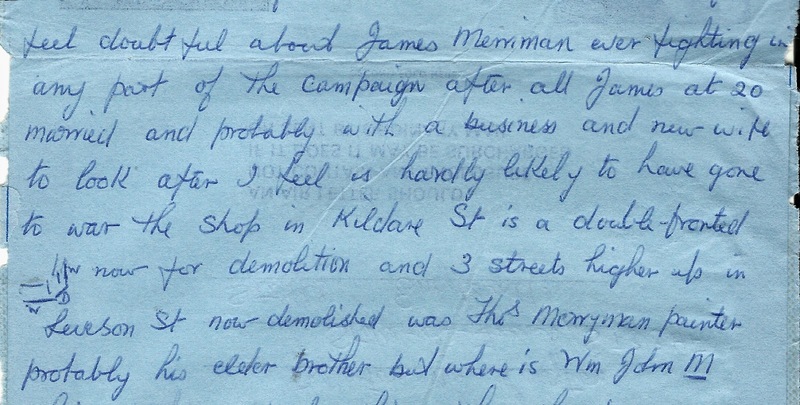 We have no surviving "letters home" to tell us of Hector's fourteen-month service with the 221st Battalion. The story is that his brief experience in the trenches was more than enough. He wanted a fighting chance to shoot back. In order to transfer to the fledgling Royal Flying Corps (RFC), procedure dictated a discharge from the army first. 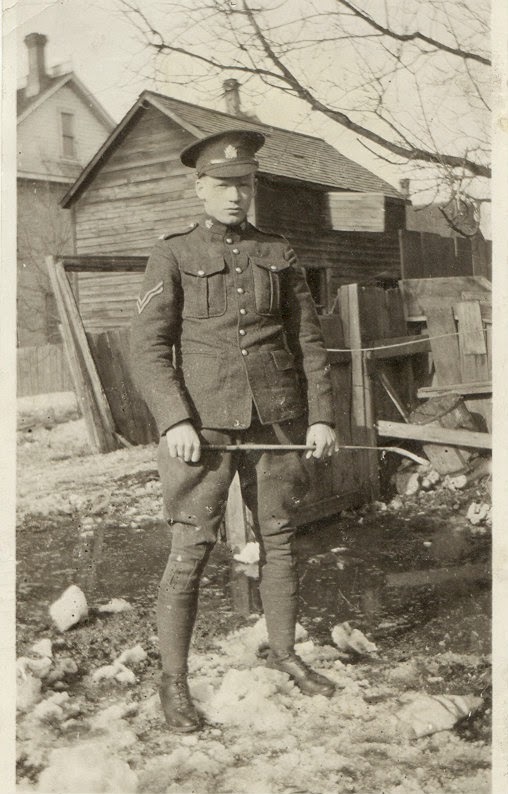 On May 5th, 1917 he was back in Canada re-enlisting. Air training commenced from then until the end of August at Deseronto, then Camp Borden, then Camp Rathbun (Deseronto). Hector's "wings" were granted August 19th and he was finally sent overseas again in September, posted to 10 Squadron RFC. 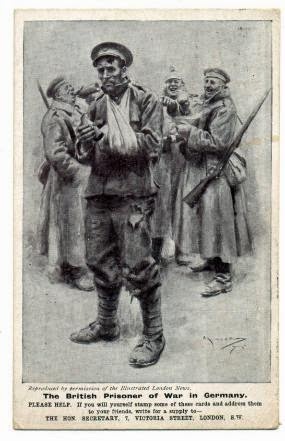 17 December 1917: "Admitted to #3 Can. Gen. Con. Hospital[,] wounds dressed and put to bed. Sick Dog. ... Willing in the spirit but not in the flesh[,] attack of pleurisy – head wound nothing but shock and exposure pretty bad." He was transferred by train to hospital in Boulogne. The wound must have been more than "nothing" because in January, "Doctor Gunn thinks me foolish to not take convalescent leave." During this time, he heard that his best buddy and fellow flier Bobby Cowan went missing in action; he fretted often about his friend. Hector discharged himself on January 15th and was posted to 54 Squadron RFC based then at Guizancourt airfield west of Amiens. 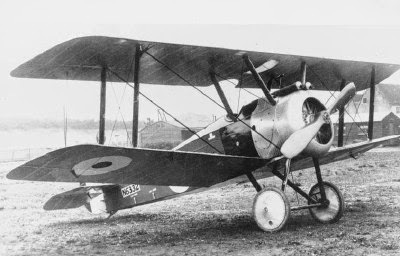 Six weeks later, his Sopwith Camel crashed behind enemy lines, February 26th. Flying inside left of bottom formation with instructions to strafe any "kite" ... cut across to Laon where I saw two "kites"[,] went down on one as they started to pull it down and just as I got one end in flames zonk a "Archie" caught me square under the engine blowing off one cylinder and tearing the fabric. One piece entering my leg below the knee the cowling flew off my machine hitting me on the head. In a few seconds I came to[,] my machine was out of control and my eyes were full of blood from my cut face and nose. 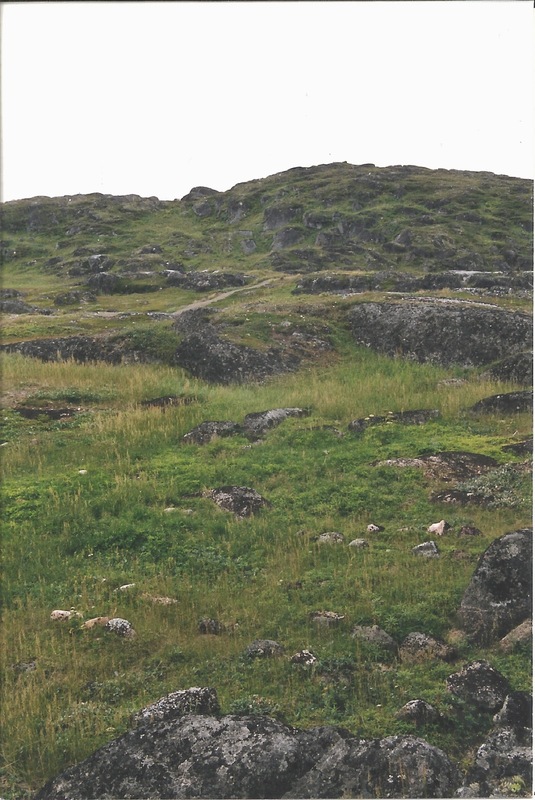 Fell about a thousand feet and tried to straighten out again[.] Just as I got flat[,] fainted again and that's all I remember until I woke up in the Citadel in Laon. With a dreadfully sore head, eyes swollen almost shut, and a queasy stomach, Hector found himself in German custody. Medical attention was withheld the next few days during several interrogations for information ― not forthcoming ― and he was threatened with losing the sight of both eyes and a court-martial if he didn't cooperate. It was a very rough few days, the least of which was when his prison-mate "got the shrapnel out of my leg with his knife and bathed my eyes." On March 2nd finally an officer came to take Hector for medical treatment, where he painfully had "a bit of glass extracted" from his eyes. I went along with him and a guard of four soldiers, down at the hospital I was put on a table where a Hun was having his leg taken off, talk about sawing and hacking[.] There was about twelve tables in the room with men on some "stiffs"[,] others going to be and others not, the blood was ankle deep[,] limbs lying around the floor ... .
March 4th began a long journey from one jail or prison to another, deeper and deeper into enemy territory with always the thought of escaping: Mount Cornet camp; Karlsruhe; Landshut; and Holzminden. Mount Cornet was particularly loathsome, "a filthy hole" of rats, fleas, and lice, where Russians were the majority of POWs. "They had no clothes, no food, they would fight in the mud for scraps of biscuits and dig potato peelings out of the garbage just to eat. Believe me it was pitiful to see men, human beings reduced to such a level." A number of escape attempts were made along the way, related after the fact in Hector's diary or by a companion's letter to his family. Stories of prison camp experiences were described in blog posts here, in 2008 and in 2013. To his heartfelt relief and surprise, Hector discovered his buddy alive when he reached Holzminden POW Camp. Jane Fryer, "Bravery of British WWI 'suicide club' whose fighter pilots took on Germany and the Red Baron with only 15 hours' training and lasted on average just 11 days," Mail Online (http://www.dailymail.co.uk/news/article-1283972/Bravery-British-WWI-suicide-club-fighter-pilots-took-Germany-Red-Baron-15-hours-training-lasted-average-just-11-days.html : accessed 20 July 2014). Lately it's becoming a struggle to answer the prompts. That may be part of a general genealogy research-and-writing block, including but not limited to a lack of (what I consider necessary) lightness for the me business. Paraphrasing: Add to your Book of Me an example of your handwriting. Share some examples from your family and/or ancestors. Has your handwriting changed over time? Perhaps include some samples of younger generations? Hmmmmm. To extend Julie's thoughts, our born-in-the-1900s generations take/took it for granted that we can write manually ― because we now have universal education, at least in the basics of reading, writing, and 'rithmetic. Pupils were encouraged to emulate the perfect, precise script of the alphabet that the teacher prominently displayed on the blackboard (do they still have blackboards?). The learning of handwriting was not particularly a priority for our more distant ancestors. Nor may it be in the future for our new "digital age" generations. There's a distinct whine going on now that, come the fast-approaching future, allegedly-educated human beings will have lost the skill (and the will) to write by hand. Our babes of the hand-held devices and glowing screens communicate socially almost at the speed of light and tiny keyboards have perforce created their own short-form language. What that means for their future employment and career activities, I have no idea. I think I will step around that kettle of fish while the stepping is still fairly navigable. Serious thought finished. Then I rifled through old files for what seemed like hours to find some handwriting samples, thinking of foreign-born ancestors schooled in a different writing style, or some of my correspondents with elegant script. You know what happened! I got distracted into sorting out things that needed sorting; I got sidetracked down memory lane. Scraps of paper from children learning to write; Grandpa's thoughts in a shaky hand that deteriorated so much with age; the beautifully rounded writing of a cousin, the one who took her own life at the age of thirty-six. Meanwhile. Genealogy blogging languishes with half-finished posts and half-baked ideas. Does this happen every summer? Maybe I'm not alone. To be honest, I spend more time on my other blog: CamelDabble TravelBabble. The camels are not shy about demanding equal time. Along with other travel tales. The Book of Me ― Prompts 43 + ― is in suspension for the time being. Bits and pieces to appear here until I get my mojo back.